With passion, flair and creativity, great production values, a sense of fun and a wealth of experience, we make great shows. Glorious is a Production House, created for touring exciting new work to new audiences, venues and site specific locations. With many years of experience under our belts, we are experts at putting on a fantastic show. We embrace the joy of creating, producing and performing with audiences that love to feel part of our work. 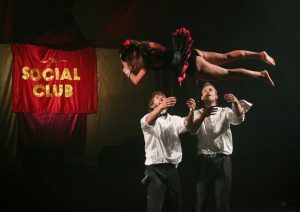 Our first show, The Social Club Cabaret is wall-to-wall with eye-watering talent, dancing on the bar, aerial skills, comedy and knife throwing – combining tongue in cheek shenanigans with world class performance. WHAT KIND OF SHOWS DO WE MAKE? on the bar and around the venue. As with a swan swimming you only see the slick beauty of what is going on above the water on stage. Whilst under the water (or backstage), there is an immense amount of skilled work driving the show and making it happen. 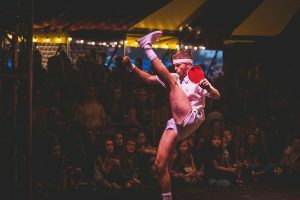 Taking our work from the festival and cabaret world to new audiences of all ages in theatres, tents and bars all around the UK and beyond. We delight in the incredible bond that occurs when people come together with an open mind and a penchant for the fun skilled, stupid, dangerous and downright odd! All-round super-women Sam Bennellick-Jones (Producer) & Annabelle Holland (award winning Director & Performer) combined their considerable forces to create the shining new phenomenon that is Glorious Productions.